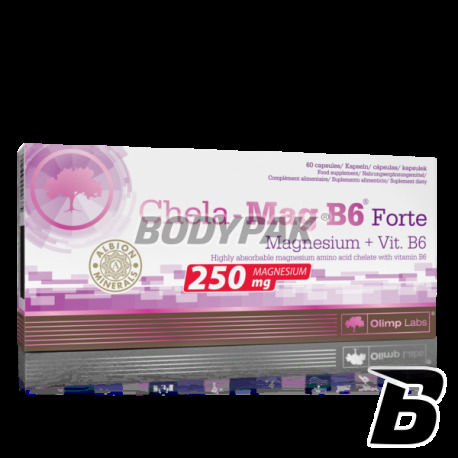 Vitamins & MineralsOlimp Chela-Mag B6 Forte - 60 kaps. Dietary supplement containing the most readily absorbed form of magnesium in the form of amino acid chelate (magnesium bisglycinate) increased dose - 1390 mg chelate Mg per capsule MEGA CAPS. Additionally it enriched with vitamin B6, which cooperates with magnesium in metabolic processes and enhances its performance. Chela-Mag B6 ® Forte helps meet the demand for magnesium - an element essential for intense weight training, participating in the processes of energy post-workout regeneration processes, memory and concentration, enhancing the resistance to stress. For what reasons magnesium is so important for our body? Magnesium belongs to the group of macro ingredients necessary for everyday life in significant quantities, it is often called the element of life and energy. Numerous scientific studies confirm that he is one of the 4 most important for the proper functioning of our body cations. Magnesium is a fundamental mineral necessary to maintain homeostasis, or balance biochemistry of our bodies. This element is involved in over 300 enzymatic reactions taking place in our cells every day. One of its most important functions is involved in the synthesis of the fuel cell without the presence of a suitable amount of magnesium production of energy required in the everyday functioning of the body is ineffective. That's why, when we lack magnesium, we feel perpetually tired. In addition, the mineral is involved in the active transport of various components of cell membranes, among other things, it helps to maintain a proper balance between sodium and potassium. Magnesium is an element essential to the daily work of our muscles and smooth functioning of the nervous system. This mineral also supports proper functioning of the heart and the entire circulatory system. What can manifest magnesium deficiency? Deficiencies of this element is a very common problem, affecting almost half the population. With the development of civilization and the progressive environmental pollution, too busy lifestyles appear gradually magnesium deficiency, which sometimes are deepened. In addition, there are many factors which may enhance the escape of the element from the body. It is mostly ubiquitous in our professional and private life stress, alcohol abuse, smoking, drinking large amounts of coffee. Unfortunately, it often our diet is too low in magnesium and does not provide adequate amounts of this very precious mineral. Why Chela-Mag B6 ® Forte? Excellent quality preparation supplemental magnesium deficiency. Unique and innovative product, containing magnesium amino acid chelate ALBION an increased dose of 1390 mg - including 250 mg of magnesium per capsule MEGA CAPS. Magnesium amino acid chelate ALBION a form with high bioavailability and efficacy, confirmed in clinical trials. Inorganic forms of magnesium are poorly absorbable further bind water in the intestine and can cause diarrhea. Magnesium salts if swallowed fall to the charged ions, which tend to neutralize as quickly as possible, only a very small part of them is bound on the road less effective, natural chelation and absorbed in the intestine. ALBION® magnesium amino acid chelate does not fall apart into ions and absorbed only in the small intestine, the entire molecule is magnesium amino acid chelate is transported to the cells in need of magnesium, and the possible excess is removed without damage to the body. Clinical confirmation of the effectiveness of magnesium amino acid chelate ALBION. The effectiveness of magnesium supplementation in the form of amino acid chelate Albion ® demonstrated in numerous clinical studies! Comparison of absorption of magnesium from amino acid chelate ALBION and magnesium oxide. The study analyzed the amount of magnesium in the blood serum after oral supplementation. The total level of magnesium 8h after administration was 206% higher for amino acid chelate Albion® compared to magnesium oxide! Comparison of absorption of magnesium from amino acid chelate ALBION and magnesium chloride. The study analyzed the amount of magnesium in the blood serum after oral supplementation. The total level of magnesium 8h after administration was 228% higher for amino acid chelate Albion® compared to magnesium chloride! Who it is recommended Chela-Mag B6 ® Forte? - Coffee drinkers, alcohol, and smoking tobacco. - The product is particularly recommended during periods of increased stress and weakening the body and for people complaining about muscle spasms and / or numbness in the extremities. Recommended daily dose: 1-2 capsules daily after meals with plenty of water and / or approx. 1 hr. bedtime or otherwise after consultation with your doctor.